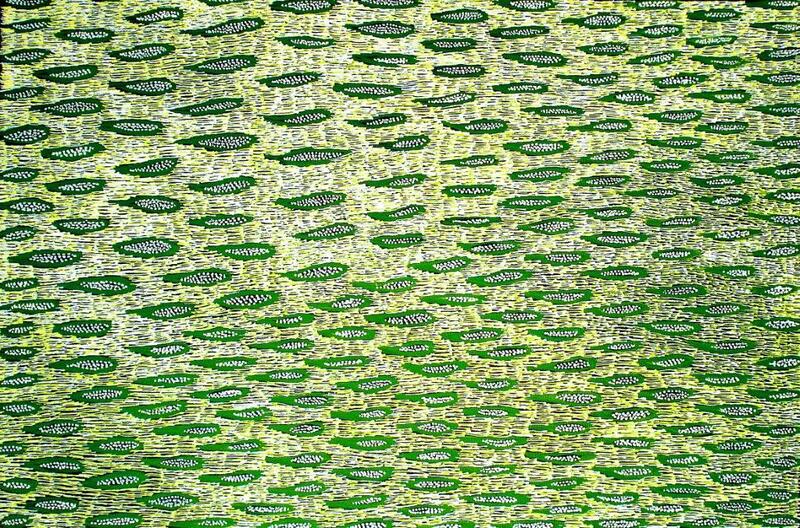 Lily Lion Kngwarreye work has been featured in many exhibitions since 1977, at Utopia Art in Sydney, the Orange Regional Gallery, Austral Gallery in St Louis USA, Royal Hibernian Academy in Dublin, SH Ervin Gallery Sydney, Araluen Art Centre. Lily took part in Robert Holmes a Court Batik Exhibition. Lily Lion work is represented throughout the world including National Art Centre Tokyo Japan, Art Gallery of Western Australia , Homes a Court Collection, Museum and Art Gallery of the Northern Territory , Portland Art Museum and Portland Oregon USA, Art and Soul Gallery Nashville Tennessee USA, New City Merchants, Knoxville, Tennessee USA, The Cove Gallery" Portland USA, Umpqua Bank Oregon USA, Mary's Woods Gallery USA, Orange Regional Gallery, Royal Hibernian Academy Dublin . Lily Lion work has the physical presence of the much contemporary work of art. Her paintings are beautiful and inspiring. Lily use very fine dot work with fascinating accuracy of macroscopically tiny dots and very delicate brush strokes . She pays attention to the details and intricate shades of colour that the image seems to move with the viewer’s eyes giving an illusion of multi dimensional appearance. 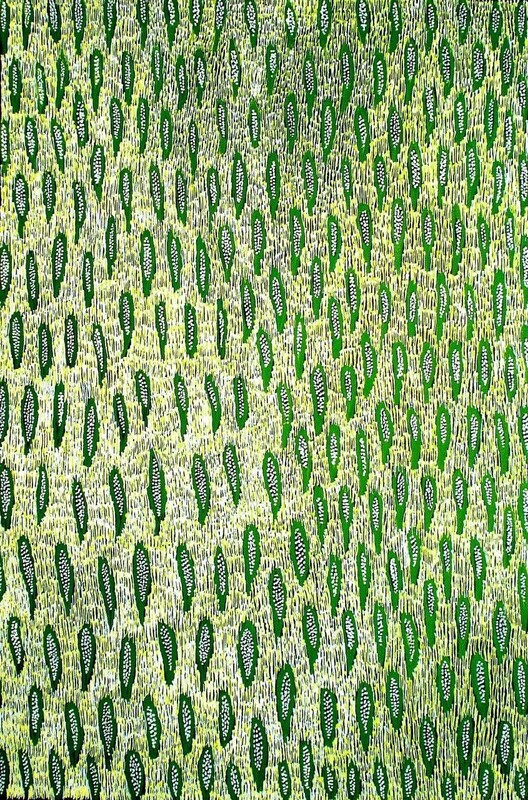 Lily Lion Kngwarreye work has been featured in many exhibitions since 1977 including shows at National Art Centre Tokyo Japan, Utopia Art in Sydney, the Orange Regional Gallery, the Austral Gallery in St Louis USA, the Royal Hibernian Academy in Dublin, and the Araluen Art Centre in Alice Springs. Lily was part of the Robert Holmes a Court Batik Exhibition. Lily Lion MB34523 , MB35621, MB35644 and MB034152 paintings are beautiful and inspiring and have the physical presence of the much contemporary work of art. Lily pays particular attention to the details. Painted with with fascinating accuracy of macroscopically tiny dots and delicate brush strokes and intricate shades of colour give an illusion of multi dimensional appearance. 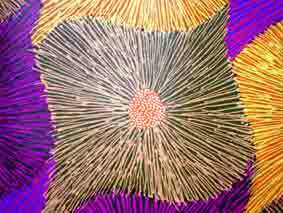 Lily designs represent Dreamtime stories of 'Ilyarnayt' Flower, (a variety of Acacia). Lily’s Dreamtime stories belong to her countries Ngkwarlerlanem and Arnkawenyerr. The stories featured include Rainbow (Mpwelarr), Ilyarn and Ilyarnayt, Tharrkarr (sweet honey grevillea, Yerramp (Honey Ant) and also a variety of Alpeyt (flowers). 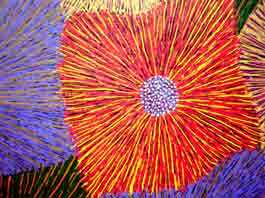 Lily paintings tell the dreamtime story of Ilyarn or Ilyarnayt representing 'Ilyarnayt' seeds and Ilyarnayt leaves. Ilyarn or Ilyarnayt plant is a common variety of Acacia. It is particularly appreciated for the abundance of edible grubs living in its roots (known simply as ilyarnayt and are similar to a witchetty grub) and also its seeds (ntang ilyarnayt). These seeds can be collected, ground into a paste and used for making damper (bread). As is common for many acacia's, this plant has small lemon-yellow ball flowers and many artists from Ngkwarlerlanem and Arnkawenyerr in northern Utopia are found to paint them. The seeds are also commonly found in their paintings, represented through dot work, and sometimes the grubs are depicted as well. There is an important Dreamtime story for this plant that belongs to these countries. Brody, A. 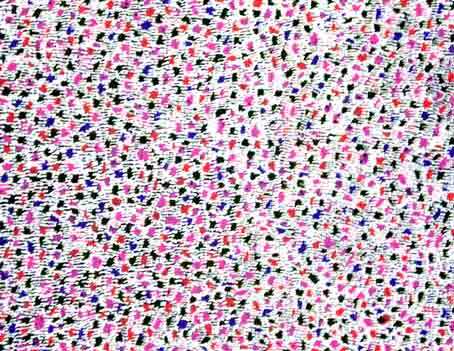 1989 Utopia women’s Paintings: the First Works on Canvas, A summer Project, 1988-89 exhib. Cat. Heytesbury Holdings, Perth Brody, A. 1990 Utopia, a picture Story, 88 Silk Batiks from the Robert Homes a Court Gallery and gallery Collection, Heytesbury Holdings LTD Perth NATSIVAD database.